We had a strange assortment of leftovers from a party, including a bag of oranges, a bunch of mint and and a whole jar of black olives. A friend recently returned from a trip to South America gifted us some unidentified dried chiles. This must be a salad! The addition of cilantro and salt rounded it out. We considered adding red onion or feta - maybe next time - but the salad stood well without them. Tod says, "The whole is more than the sum of its parts. Each ingredient contributes its own unique character and the salad wouldn't be the same without any of them. The chiles contribute a shocking level of capsaicin but the mouth quickly grows used to it and, in fact, craves more. Just the level of spiciness that addicts seek out. The oranges are all sweetness, the olives provide a roundness, the cilantro is a high note and the mint a cool relief." There's no particular recipe, but we used two oranges, a big handful each of mint and cilantro, a tablespoon of sliced black olives and a 10 cm soaked dried chile snipped into shreds. Tod's been cooking up a storm over his long two-week winter holiday. Over the last couple of months, we kept seeing interesting waffle recipes, so this break has been taken us from "we should try that" to "that was delicious." This is my report on Tod's tasty experiments. 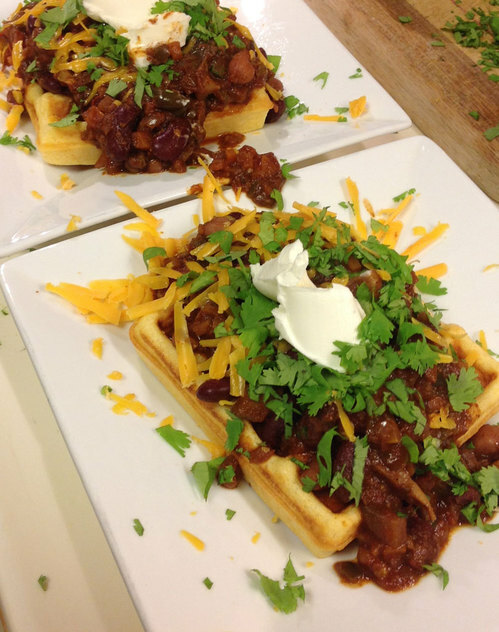 The waffles are barely visible under all the chili and toppings. This one was based on Joy of Cooking's Northern Cornbread recipe, http://www.foodgeeks.com/recipes/northern-corn-bread-20218, which uses yellow corn meal and more sugar than a Southern cornbread. We figured that might be good for waffles. It worked pretty well, but next time a little less sugar and maybe a wetter batter. This was an early experiment before the winter break. After eating a dinner's worth, we froze the rest of the chili and waffles in portion packs for a rainy day (or whenever the flu arrives here). Rice in the waffle iron. Who knew? The next waffle really kicked off the waffle experiments. We'd made a slightly overcooked batch of rice and set it aside in favor of better cooked rice. The next day, I was in charge of lunch and I pulled together a soup of leftover vegetables, this rice mixed with a bunch of seeds (cumin, mustard and sesame) and some sardine burgers I had in the freezer. With sweet chili sauce in place of maple syrup, it turned into quite a nice meal. Rice in our waffle iron got crispy on the outside and a tiny bit brown, but stayed chewy on the inside. I'd hoped for a more brown crispiness, but it was fine. And then the waffle iron out and Tod got excited for the possibilities. 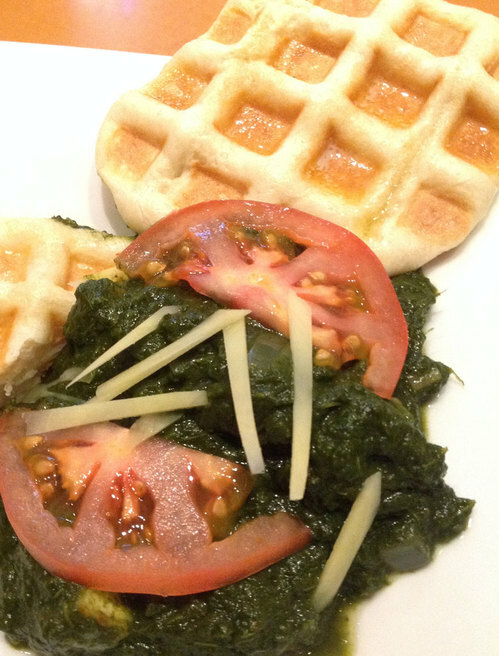 Naan-ffles with Saag Paneer, an Indian spinach and cheese curry. I am not sure what made Tod want to try making paneer from scratch, but the grocery list was suddenly rather heavy on the milk and lemons. It worked beautifully, especially when combined with four bunches of spinach cooked into saag curry. 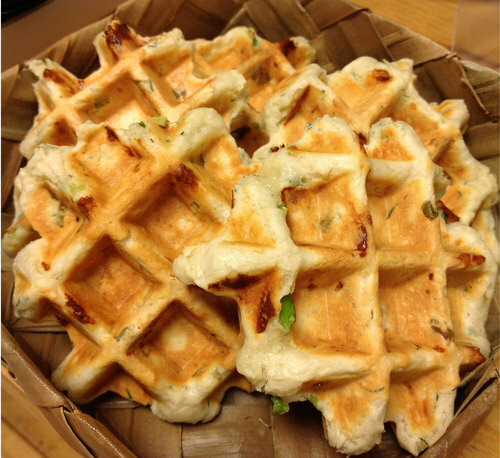 With the waffle iron at hand, or course the naan became naan-ffles. Tod used Manjula's naan recipe and it turned out great. We also got to test out our oven's "soft" function for the rising. Effective! It looks like styrofoam, but it's not. This is major magic. Mochi is a dense rectangle of rice paste that killed two people in chocking incidents over this new year. 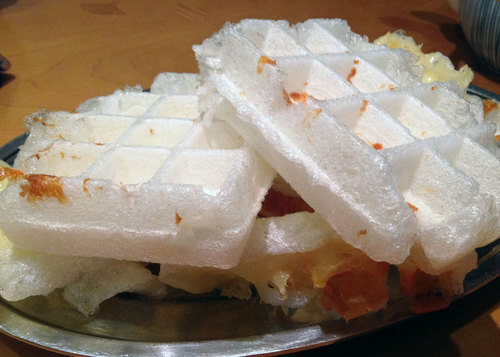 Moffle - mochi waffles - are fluffy, chewy crispy delights. 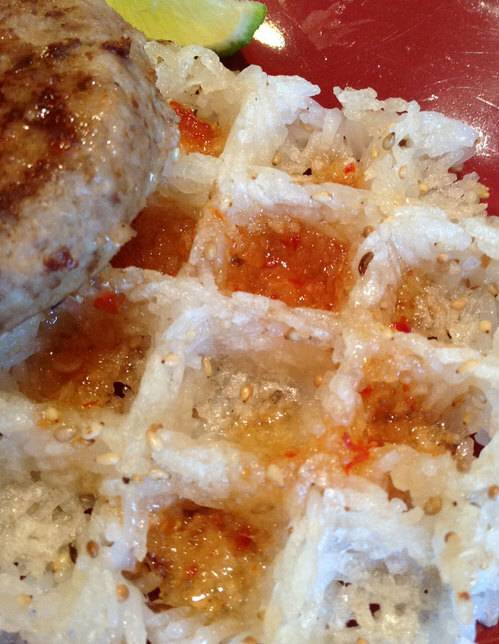 If you don'd do mochi in your waffle iron, you are a fool. No recipe. Just put it in, press gently while the mochi relaxes into the squares, then let it cook for six minutes or so. We even topped ours with crappy plastic-wrapped "torukeru" cheese (the Japanese equivalent of Kraft Slices) heated on the waffle for a minute in the waffle iron. Delightful. Dark spicy gingerbread. So festive! This recipe turned up on Smitten Kitchen just before Christmas and it is the reason I wanted to make any waffles at all. Wow, so good with a strong molasses and spice flavor. It's a weird one, though. When you pull it out, it is floppy and soft. Once you extract it, it crisps up. We ate it as shown, with a snow of powdered sugar. Leftovers got a fancier treatment as dessert with some ice cream and chocolate sauce. Tod declared that dessert worth having again. 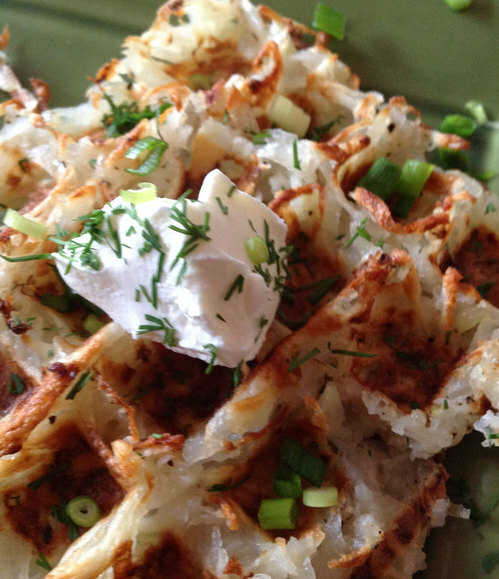 We'd see a few waffle latke recipes but Tod decided to go simple and try basic hashbrowns - shredded potato with onion - in the iron. It worked pretty well. He salted the mixture and let it sweat a bit, then squeezed the liquid out. The results were crispy and well-cooked, but not easy to get out intact. There wasn't enough binder. Next time, we'll try the more battery latkes. Bleu cheese and onion biscuits, wafflised. This one was my creation. I wanted to use up the leftover soup from the rice waffle day, so I made some biscuit dough. I don't use a recipe for biscuits; it's random every time. This one was 1.5 c flour, 2 t baking soda and 1/2 t salt in a bowl. Some coconut oil (3 T?) and the leftover bleu cheese yogurt dip (1/2 c?) worked in until it felt right. Then about a 1/4 c finely chopped scallions and milk until it formed a soft, wet dough. These worked really well in the waffle iron, browning nicely on all surfaces. 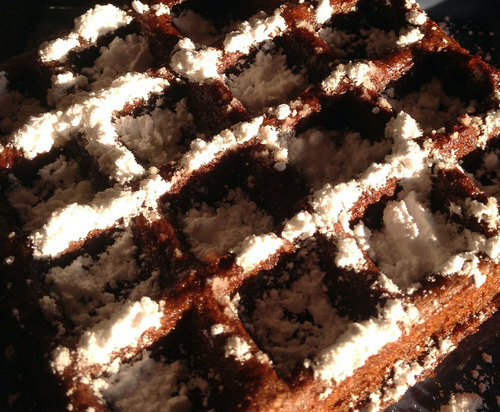 That is the final one of our current batch of experiments, but I think that we'll be playing more with the waffle iron. Ichigo-gari with Heather and Zio yesterday in Tochigi yielded 1.6 kg of berries. The berries are grown in long hothouses through the winter. 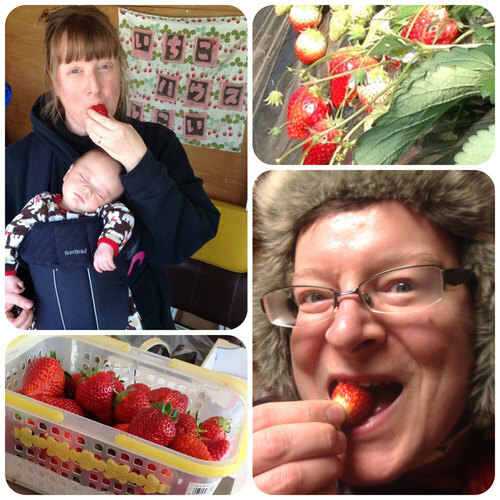 Another month or so and strawberries will be off the local produce menu until autumn, so I am glad to have picked some this season. We'll have frozen strawberries for summer smoothies. Tod was delighted when I came home with a full tray. The little ones are sweet and juicy and some of the berries were so large that they filled our hands and we bit into them like apples. The summer weather in Tokyo is always brutal. Every year seems worse than the last, but it's usually about the same - there are a couple of weeks when it is entirely too hot to eat, think or do much of anything. We push through the days without aircon here at home. It's not a pleasant time of year for me. But I have some strategies. We are currently in smack dab in the middle of one of the hot periods, so I stocked my fridge with juice boxes. When I can't bear the idea of a meal, I can manage one of these. Maybe even a couple of them in a row. 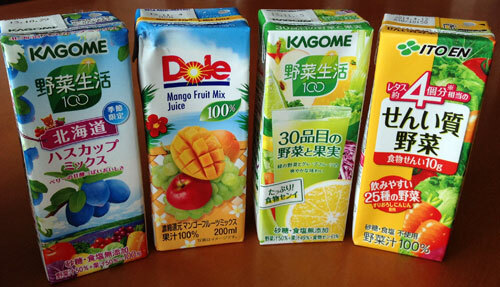 This selection is 100% juice and mostly vegetable-fruit mixes because I like them best. The one on the left is especially interesting. It features haskap, a honeysuckle berry. I'd never heard of them before and they are tasty. This year I am also making myself homemade electrolyte solution. I used electrolyte powders while at the circus in Thailand and they were helpful but tasted nasty. Now I make my own with a squeeze of citrus and a pinch each of salt and sugar in my water bottle. Is it a perfect recipe? Not at all, but it breaks up the monotony of plain water and should make it easier for my body to absorb the moisture I am giving it. Another liquid survival technique we use here is the cold bath, which is what is sounds like, a tub full of cold water sometimes made even colder with some ice packs. I plunge in and soak for a few minutes to bring down my core temperature. It's even more refreshing than air conditioning and has the added benefit of washing off the sweat. Dessert last night blew me away. Pictured above you see a "deconstructed apple crumble" that involved nitrogen-frozen whipped cream with a hot caramel soup poured over cubes of apple, cinnamon cookie crumbs, caramel ice cream and a slice of dried apple. 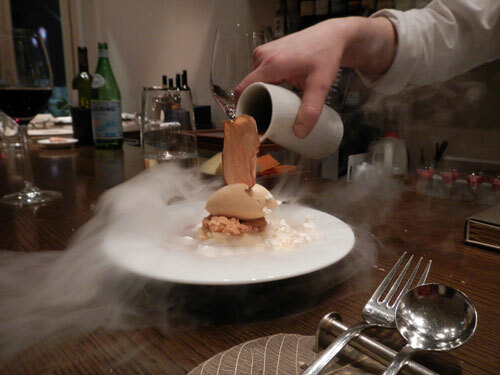 It was such an impressive presentation and my first experience with "molecular gastronomy." The rest of my birthday dinner was equally stunning. 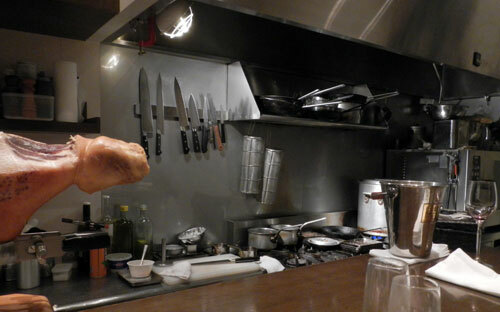 We dined at Citta' Alta, a tiny ten-seat place right around the corner from our house. 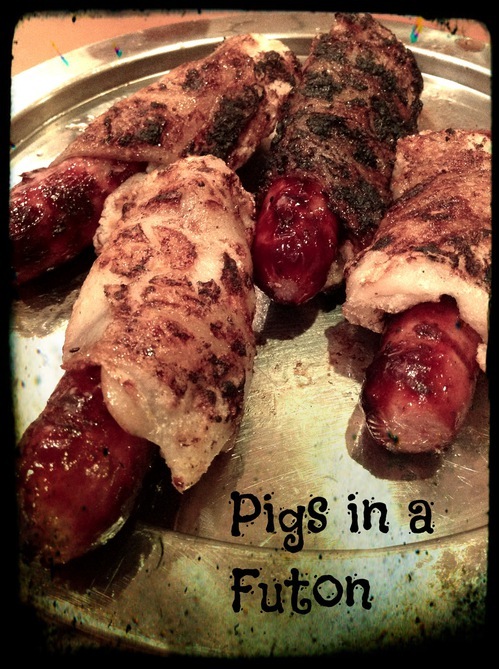 There is only one option at dinner - the full course - and it was incredible. Starting with a "salad" that involved green pea whipped cream, we enjoyed a fish course that was garnished with ethereal lemon foam, fois gras served on raisin toast with and drizzled with chocolate sauce (plus a side of savory fois gras creme brule), homemade pasta with clams and tiny whole squid, and porcini risotto with strawberries in it. Then cames the mains! I had a pork cutlet served with an onion that had been roasted for 3 hours and some vegetables that were beautifully pan seared. Tod chose the duck with five spice sauce. Both were delicious. Then it was dessert time. In addition to the apple crumble we had a tiramisu, deconstructed again, that was incredibly delicious and very pretty. Then the final dessert - marinated strawberries with yogurt injected shirotama and a minature scoop of green tea ice cream. And when Tod mentioned it was my birthday, the chef sent over ("over" being across the counter - this place is all chef's table!) a dish of ginger ale jelly with fresh ginger sorbet. Wow. 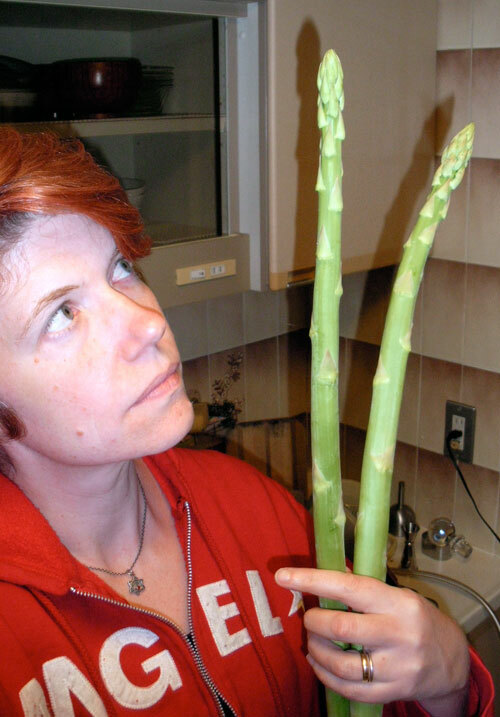 Absolutely enormous asparagus. Not from Fukushima. 398 yen per stalk. Today in the supermarket, I expected to see some empty places in the produce aisle - conspicuously absent spinach and leafy greens with apologetic signs regretting the inconvenience. But I was wrong. There was as much spinach and other greens as usual. All from Chiba and Saitama, areas adjacent to Tokyo. But I think that abundant produce won't be the case forever. The government is making farmers in four prefectures destroy their crops and we will feel the pinch soon enough. Of course, we aren't going to starve; we will make do with what comes our way and it will be plenty, if not always exactly what our recipes call for. As for tonight, while I have the luxury of buying exactly what I want to eat, I am going to enjoy my spinach - and the huge asparagus. 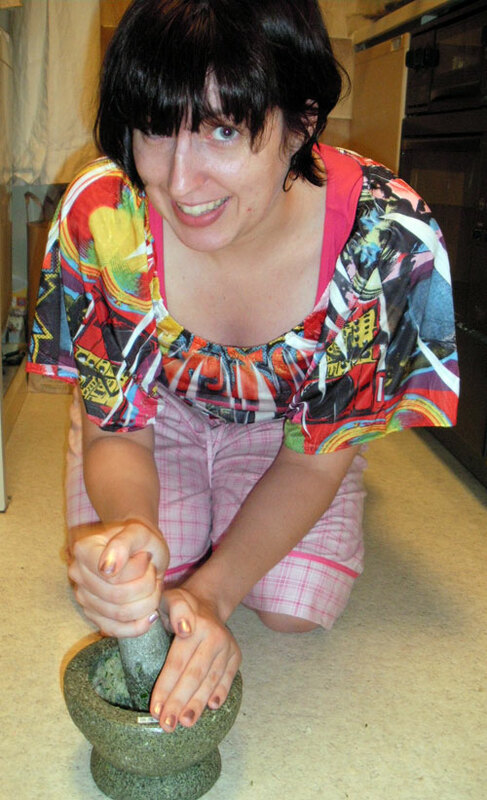 Amanda gets down on the kitchen floor with the curry paste tonight. During our Chiang Mai vacation, we indulged in a lot of Thai food and took several cooking classes. The first class was a day at the Thai Farm Cooking School where we visited a farmers' market, toured the school's organic farm, ground curry paste by hand and made more food than we could eat, including curry with our fresh paste and a dessert of mango with sticky rice. A few days later, the cook at Maesa Elephant Camp led us through some simple recipes at dinnertime. Back in Chiang Mai we did an evening course at Baan Thai and made fish cakes, soup, more curry paste and the local noodle dish, khao soi. I was sort of surprised at how none of the cooking methods were exotic - mainly stirfry and simmering. Curry is basically fried vegetables simmered in coconut milk. There's no major mystery to making tom yam soup; it's just a lightly boiled soup. Steaming rice is a bit different than boiling it, but even that is just steaming. It was the ingredients that made all the difference. So many good smells in Thai food, as Tod says. We worked with kaffir lime leaf, fresh lemon grass, members of the ginger family and oh, those tiny bitter eggplants! We despaired of ever recreating these dishes in Tokyo, despite our instructors' enthusiastic entreaties to "Please cook Thai at home!" But today, Tod discovered a Asia Superstore, a Thai grocery in Okubo near Higashi-Shinjuku station. He biked over and came back with a mortar and pestle and everything else needed to make curry paste. They even had the eggplants. I recently noted elsewhere that I prefer vegetables to fruit. This is strange because I generally prefer sweet over savory. But given the choice between a tomato and an apple, I'll take the tomato. So why is that? I think I figured it out. Fruit doesn't meet my expectations. It should give me instant gratification. I want to grab a whole fruit cold and crisp from the fridge and eat its sweet, juicy goodness, as if it were nature's candy bar. But it rarely works that way. Fruit usually needs as much preparation as vegetables - peeling, coring, slicing. I don't expect it to be so even though my experience proves it is. Fruit is unpredictable. It may look gorgeous, but it isn't always ripe or juicy and it's hard to tell before you taste it. The surprise of a mealy apple or a sour plum isn't a good surprise. And fruit doesn't stay in its optimal state very long before going bad. While a wilty carrot makes good soup, a withered peach is trash. But I have found a solution that solves my issues. I turn my fruit into juice. Blending a couple of fruits together evens out any unripe bitterness, and I expect juice to need preparation so I'm not disappointed that it isn't instant food. Plus I can toss in vegetables, ice and other flavors to make smoothies. Tomorrow I'll share some of my smoothie recipes with you.